people reached through our multi-channel digital marketing campaign for Seven Seas. increase in organic traffic year on year for Minerva Education: Hyde Park School. increase in e-commerce transactions referred from Facebook for High Street TV. decrease in cost per conversion for St. George's University. campaign visits to the Booths website in four weeks, accounting for 1/3 of total traffic. we are very pleased with the final product. We’re a strategic digital marketing agency with a hard commercial focus and soft creative centre. We generate highly visible data-driven campaigns which focus on the hearts and minds of the consumer and their journey to buy your products or services. Our digital marketing experts create, implement and analyse your campaigns in order to deliver an ever-improving return on investment. We appreciate that every client is unique therefore every digital strategy we create is bespoke. Emotional intelligence, not robotic thinking, is the single common constituent in each campaign. We’re the Only agency and we’ve broken free from the digital straightjacket. We’re not interested in selling commodity services or replicating the tactics of yesteryear. Game-changing digital and mobile campaigns are what we’re about. Simply put, we woo consumers so they try, buy and rely on our clients’ products and services. Speak to us if you want a team of smart, passionate people to build your brand, drive sales and accelerate growth. We’re a data-led digital agency. Data is the starting point for everything that we do. By unlocking its power we help clients make better decisions. The insights garnered by our data analysts coupled with our strategic creativity are what give our digital strategies commercial bite. We’d relish the opportunity to get our teeth into your brand. We have a team of 130 marketers and all of them are specialists. Some focus on strategy, others specialise in search, some design websites while others build them. We’ve a chunky social team, a handful of mobile and email marketing experts not to mention fabulous content creators whose output spans videos, TV ads, graphics, the written word and everything in between. Some clients want us only for SEO or PPC but most upgrade our remit to cover fully integrated marketing and communications. Everything is digital these days and the best marketing strategies have multiple routes to market. Mobile is overtaking the internet in the same way as TV outshone radio but the wireless is far from dead and the internet still has years of life in front of it. Our strategies embrace old and new technologies and traditional and emerging channels to market but we never forget that hype often turns to tripe and what hits the headlines can be a footnote a few months down the line. We promise to keep you up to speed with what’s hot but we won’t spend a penny of your hard-earned marketing budget until we’re cool that it works. You can take it for granted that our digital marketing strategy will be totally aligned with your business strategy. We’ll also make sure it integrates seamlessly with your brand, channel and customer strategies. We can only do that by being part of your team and developing a deep understanding of your business. That’s why we invest an inordinate amount of time getting to know you. Only by becoming insiders, we can solve your problems, provide game-changing insights and help you overcome hurdles that might be detracting from your commercial performance. With nine offices in the UK, we’re on your doorstep wherever you’re located. Our regional hubs make it much easier for us to be part of your team. If you need us in your office we’ll be there. If you prefer to meet in one of ours, you’ll find us in London, Birmingham, Manchester, Leeds, Glasgow, Edinburgh, the South East, South West and Central. 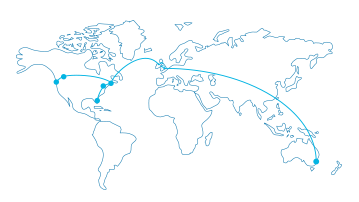 If you require our support overseas, you’ll find us in more than 100 business capitals worldwide. Our rivals are always on the prowl for new business. Getting bigger is not what we’re about. Getting better is all we’re about. That’s why we’re choosy about who we work with. There are only 130 of us and we prefer to work with clients we like, brands we respect and companies where we can make a material difference. Your size is not important. We work with brands big and small. What matters to us is that you are ambitious, dynamic and want to be the best-regarded brand in your sector. We’re not a cheap date. In fact, we’re reassuringly expensive. But pound for pound and dollar for dollar, we’ll give you more bang for your buck. We’ll also delight you when it comes to client care. We demonstrate client love in a myriad of ways and our people are rewarded on how they WOW! our customers. For instance, each member of our team benefits from three days of residential training each year and we invite our clients along to these sessions free of charge.